I haven't updated the group as of life things lately, so that is what today will be. Get excited, y'all. lol. First of all, today is my Friday!!! The fam and I have a long weekend in San Antonio for a family reunion! We don't really do family reunions, but my Uncle Joe and Aunt Nan and their family who live in Georgia are coming to Texas for a visit, so the whole gang is getting together. So.many.cousins. Irene the cat has offered to guest post tomorrow, so look forward to that, lol. The magic day for exam 1 is July 5th. It seemed perfect because it is a Friday right after a day off...except I want to be festive and full of margaritas the day before, not cramming tax knowledge into my brain :\. Oh well. I'll survive I guess. I just really need to get on the ball moreso than I have been. We have just been out of town a bunch of weekends, and there is too much good TV on this summer. It doesn't help that I feel like I already know this stuff, and I can probably just wing it and do alright. Famous last words. Once we get back from San Antonio it is going to be on like Donkey Kong, for real. I hate summer so much. I almost put the bulldog picture on my blog last week. It just represents the misery of summer so perfectly. 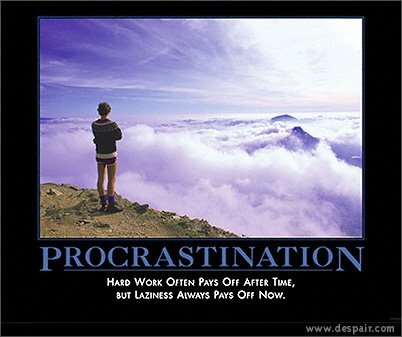 You procrastinate? No. Never. :)Tell the family I said hellooooooooo. Hope the reunion goes well. I'm so jealous! I love visiting Nic's family in San Antonio mainly because of the mexican food and bbq LOL.